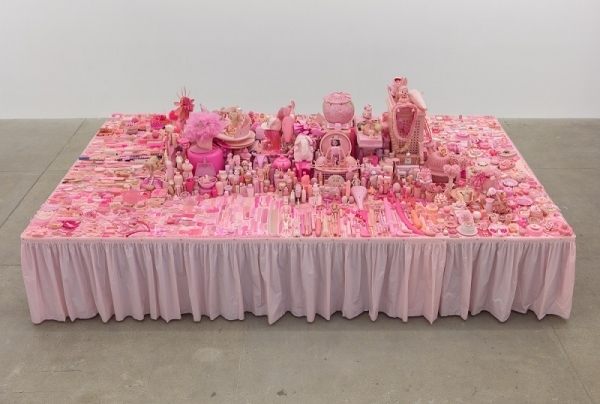 Portia Munson, Pink Project: Table 1994, found plastic, 29 ½ x 96 x 160 inches. Copyright Portia Munson. Courtesy PPOW. Everyone’s eyes are being drawn to the unmistakably pink installation at Frieze. Portia Munson, the artist behind “Pink Project: Table,” is part of the P.P.O.W. booth. The New York gallery is representing four generations of feminist artists at Frieze London, and promises the exploration of the complexity of the female identity. “Pink Project: Table” is comprised of thousands of discarded pink items, carefully arranged on a table. Munson first debuted the piece in 1994 at the New Museum as part of the Marcia Tucker-curated exhibition, “Bad Girls.” With this installation, Munson performs an empowering color reinvention, challenging gender roles and disrupting the association of inherent feminine weakness with the color pink.